Since the theme of this week's Carnival of the Recipes is easy/hate-to-cook recipes, I thought I'd post my SIL's Microwaveable Lemon Curd recipe. Lemon curd is pretty easy to make anyway, but this is the sooper-dooper easy version, for the very laziest of cooks. Now, for the really REALLY lazy cooks who don't want to mess about with fresh lemons to get the "zest", a splash of lemon extract will add some extra-lemony flavor. Or you can just leave that step out altogether. It's extremely yummy even without the zest. 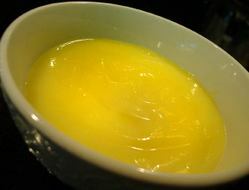 Now, what does the lazy cook DO with this easy lemon curd, you may ask... THAT is another post for another day. Very interesting post it gives me the best options on recipes i really enjoy looking at your blog very helpul for us that want to try different stuff for our familys thanks for the post. Curd and lemon combination that will be more sour and sweet. I will try that. Wonderful recipe. Like that dish. Will wait for the other. I never thought to make this in the microwave. The first real lemon cultivation in Europe began in Genoa in the middle of the fifteenth century. It was later introduced to the Americas in 1493 when Christopher Columbus brought lemon seeds to Hispaniola along his voyages. Good creativity. Very simple and tasty! Hey Kat! LOL, I know exactly what you mean. I love this stuff, I could have eaten it all by myself straight from the jar. You have done me in with this recipe. It was only time which kept me from making this and eating it all by myself. Now I'm in trouble! This is without a doubt, one of the easiest recipes! My sister in law is an amazing resource for all kinds of recipes. I hope you like it! Let me know how it measures up, KeeWee. I never thought to make this in the microwave. I LOVE lemon curd and think it is about time I whipped up a batch, especially as you have shown how easy it is using the microwave. this is a wonderful recipe!! i never thought it'd be that easy.